We often read new about people getting huge packages in millions from different esteemed companies. Have you thought what makes them eligible to get such a huge package? The quality knowledge, the demand for your qualification, adaptability, and many other factors enables you to get a huge package from both private and government organization. Ultimately who don’t want to get best? Another option can be like starting your own business but that will come under entrepreneurship. Today, we are talking about the jobs and in this post I will be talking about 10 highest paying jobs in the world. About those jobs which attract the top minds from all across the world. You must have seen people leading corporate meetings, leading teams or managing the business work in formal attire with a tie and looking like a gentleman. Those are mostly the management professionals from the B-Schools. These professionals are one of the top paid professionals who handle the business strategy, marketing, finance, Human resource and many other departments of the multi-million dollar companies. Although there are many business schools in India, but IIMs, XLRI etc. are among the top. To get into these top colleges, you will have to write CAT, XAT etc. This is a very attractive sector due to attractive packages and perks. Young India is highly motivated towards this sector. This sector usually follows the standard path with five levels including Analyst, Associate, Vice President, Director and Managing Director. Companies like Goldman Sachs, JP Morgan Chase, Deutsche Bank, Globeop Financial Services Ltd and HSBC are among the top employer for investment bankers. One of the old but still among most popular fields, where you can get great salary as per your qualification. Although every year India produces lacks of engineering graduate which has made this field highly competitive but still the top gets the best. Graduates from the top institutes like IITs, IIIT etc. are getting attractive salary packages from the top employers. To get into these colleges, you will have to appear for JEE Main, AIEEE and such similar exams. CAs are the one which audits the company’s finance and helps you in returns, managing the payment better and much more. They help the company in financial accounting, tax management, auditing, cost accounting, banking and consultancy. The majority of the commerce graduate in India at least think once about becoming a CA as these guys get some huge salary and perks. Doctors are considered as the living god who saves human life. Together with this, they earn huge amount also which includes both government doctors as well as private practitioners. There are different fields in and medical professionals choose among those as per their interest. An AIMS is considered as the top institute for MBBS. If you enjoy the water, this sector can be a perfect choice for you. The only thing is the majority of these professionals have to be on the site. These people usually don’t get much space for social life but is among the highest paying jobs in India. Companies like ONGC, IOCL and Bharat Petroleum are among the top employer in this field. Does height admire you? Well, then aviation sector can be your dream destination. There is a constant demand for qualified pilots, ground staff, stewards, air hostesses, etc. These professionals receive handsome salary along with attractive other offers from the airline's companies. These professionals hold the business and product expertise along with process which helps the organizations to manage and transition their projects well. They understand the client requirement, research the industry and field, analyze competitors, do a risk assessment, planning and make an unbeatable plan which takes the business on the success path. Generally, the career path of a consultant moves from analysts, consultant, senior consultant, manager/project lead, partner and vice president/director. If you have a handsome personality and have an interest in this field, it can be your ideal career destination with great money as well. There are various fields like Movies, Theater, TV, ad commercials etc. where you can get god money for acting and modeling. Salaries for law professionals vary broadly as per their employer and track record. The more experienced law professionals’ charges more compared to the freshers. There are many lawyers in the top court of India who charge a Million for one day trial and so you can think of how much potential this field has. But again there are many who struggle to live a life on their income. These were the top 10 highest paying jobs in India. Basically, these are the fields which provide the top paying jobs and professionals from these sectors are always in demand. But again as the competition is high and so you would need to be talented, hardworking and smart enough to handle any situation. Not only these are trending in India but the whole world’s trend is somewhat similar. 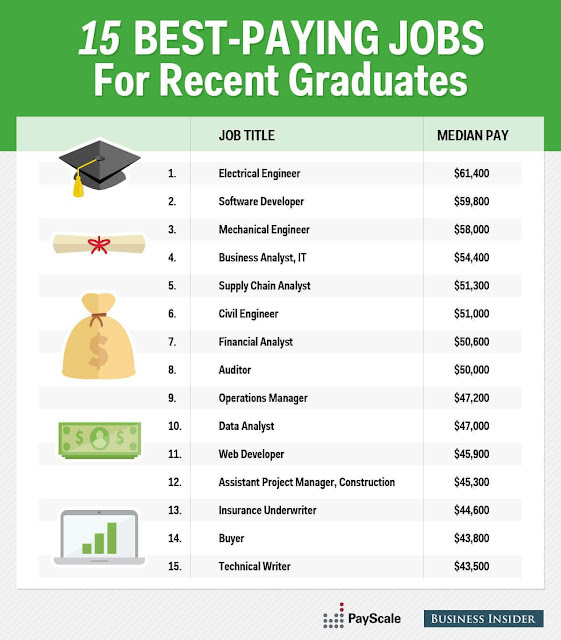 You should have a look at the below infographic from PayScale. These 10 highest paying jobs in India are just listed in random order and I think if you are capable, you can earn huge in any field.